Do you have ancestors who served with the Australian armed forces during World War I? Look for them in Fold3’s Australia WWI Service Records collection! This collection (via the National Archives of Australia) contains service dossiers for Australians who served during World War I in the Australian Imperial Force (AIF), Australian Naval and Military Expeditionary Force (AN&MEF), Royal Australian Naval Bridging Train (RANBT), Australian Flying Corps (AFC), or Australian Army Nursing Service (AANS). 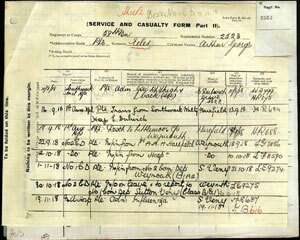 It also includes depot records for personnel who served at home rather than abroad during the war. Navy records are not included. The service records in this collection are not meant to cover all aspects of a person’s military service; rather they are administrative files that provide a general overview of that individual’s service. Maintaining these service records was originally the responsibility of the Base Records Office in Melbourne. The office was created in October 1914 to manage the high number of military personnel records resulting from Britain’s (and thus Australia’s) entrance into World War I. Besides managing the records, the office also fielded questions relating to casualties, wills, medals, pensions, mail, and personal effects. Two of the most common documents that can be found in most of the service records are an Attestation Paper and a Service and Casualty Form. The Attestation Paper, filled out by the individual when they enlisted, provides basic biographical information, such as place of birth, age, marital status, religion, employment, next-of-kin details, prior military service, and physical description. The Service and Casualty Form contains rudimentary details of the person’s service, including movements and transfers, promotions and awards, and details of illness, injuries, and death. In the 1950s, the Department of the Army culled extraneous documents from many of the service records, leaving behind only those deemed essential. Thus, the types of documents remaining in the service records can vary widely but may include notifications to next-of-kin regarding death or injury, letters concerning a soldier’s location, details of awards and medals, pay information, wills, information about wartime marriages, medical reports, and burial information. On Fold3, the service records are organized alphabetically by surname, then by given name and service number. 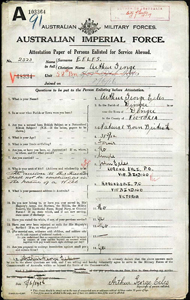 Get started searching or browsing the Australia WWI Service Records here. No. I do not have relatives who served in Austalia. However I do have relatives who served in the RCAF in the British initiative to train pilots at Brantford, Ontario. Any suggestions? If a US enlisted and transfer occurred, where are this records? An excellent record and one where you can find so much information on the person and their family. I found one relative serving who does not appear on any other family histories and he does not marry, therefore no descendents to do the chase. This record gave his date of birth, place of birth and named his mother as his next of kin, which left no doubt as to whose family he belonged to. A magic find especially with a complicated name like McGUINNESS and all it’s variants. was he a member of Hogan’s heroes? I can’t even get my late father’s Korean War era medical records. Seemed my last hope of finding the birth record of his child by first wife, born in late ’50/early ’51. Go to the National Australian Archives site at http://www.naa.gov.au for questions about other records that are available. All of WWI is digitised. You can apply for other records to be opened and digital copies made but it can take a number of months and there is a charge of about $50. Each request must be examined for sensitive information before it can be opened.